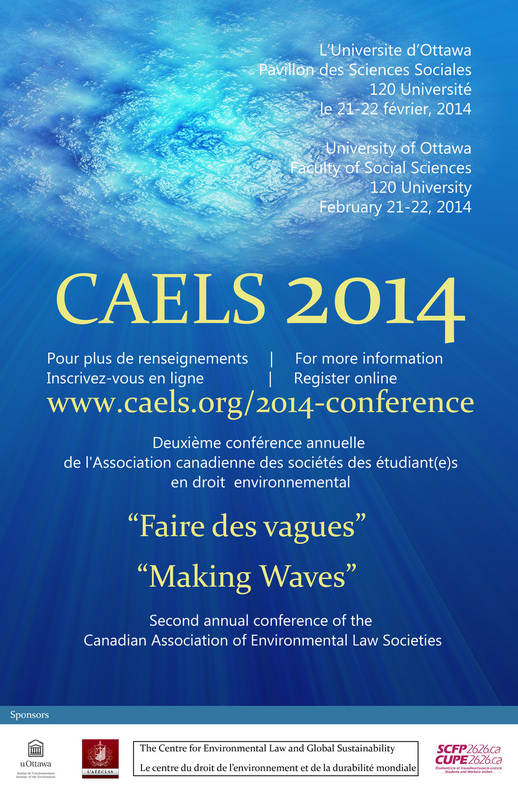 The Canadian Association of Environmental Law Societies (CAELS) would like to invite you to attend “Making Waves/Faire des vagues,” their second annual environmental law conference. The conference is an interdisciplinary event bringing together law students, lawyers, scientists, and community members to discuss current issues in Canadian environmental law. This year’s conference is focusing on water law in Canada and on increasing public participation in environmental decision making. Pippa Feinstein, Law Foundation of Ontario's Public Interest Articling Fellow at Lake Ontario Waterkeeper, is presenting a workshop on how citizen scientists can play an important role in protecting the environment. Participants will learn how collecting and sharing data is the first step to better environmental stewardship. Description contributed by Mark James, CAELS Co-Director via Green Living Ottawa.